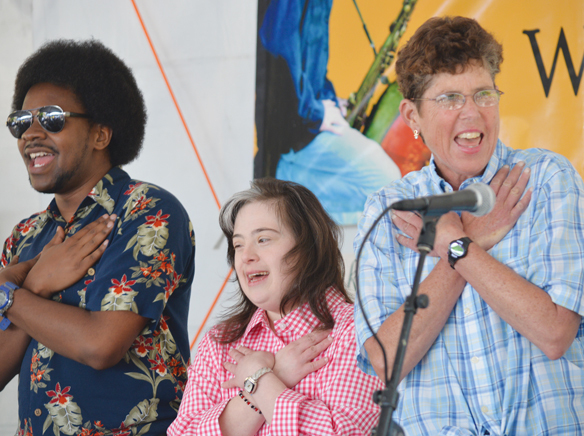 St. Madeleine Sophie’s Center Singers took center stage at Saturday’s fundraiser. With song and dance, the singers and dancers lit up the crowd with a country medley and boot-scooting as hundreds of people participated in silent auctions, and bet at the afternoon rubber frog races. All to help St. Madeleine in raising money to help sustain its efforts in supporting the differently abled community. St. Madeleine’s 15th Annual Morning Glory Brunch, an event that drew crowds from all over San Diego County. Five acres of a phenomenal landscape in El Cajon, the grounds hosted silent auctions, wine tasting, boutiques, gardens, artist and entertainment. In 1966, the Religious of the Society of the Sacred Heart started a program for pre-school and differently abled children. It began in one classroom and eight students. In 1972, St. Madeleine began focusing on adults. Expanded opportunities provide individuals fuller lives, jobs, income, and participation in life’s simplest pleasures. Clients work with painting, arts and crafts, gardening, computers and weaving. St. Madeleine has helped people, families and communities, to discover and nurture potential – giving many a chance to live life to the fullest. It provides programs that allows students to learn, grow, and enjoy friendships and social activities throughout their lives and gain independence and self-esteem from recent high-school graduates to seniors in their 80s. Jeff Fullerton, events and marketing coordinator said he loved working at St. Madeleine. “You walk in and it warms my heart,” he said.